We've been in our house now for almost three years. The first thing I snubbed my nose at when we viewed it was the kitchen. While it wasn't awful and was livable, it was dark and dated. Our house was built in the late 90's, apparently at the peak of the oak era. 😂 We have it everywhere and I really don't like it! 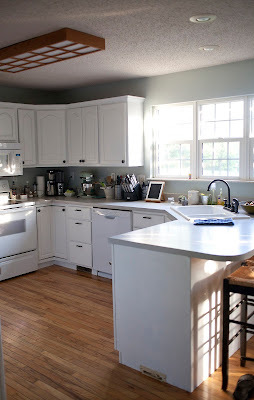 Home from vacation we set our sights on redoing this kitchen. We started with painting the walls, it took us no time and I took this as a great sign that maybe everything else would be quick. 🙄 If you think painting cabinets will be a quick fix, think again. It was tedious, soooooo tedious, but so worth it! I love my new kitchen so much! Step 1; clean/wipe down the doors and drawers with a bleach water solution. Do not skip this step! The paint we bought says there is no prep work, such as sanding or priming, but you absolutely do need to wipe off the years of grease and grime. Next we removed the doors and drawers, using painters tape, we numbered them, that way when we reattached we would have no guessing. Saves you time and hassle! Hubby sprayed the doors and drawers. If you have a sprayer, use it! It saved so much time and effort and honestly the paint coverage is so much nicer! He used Dixie cups to hold up the doors while they dried after painting each side. 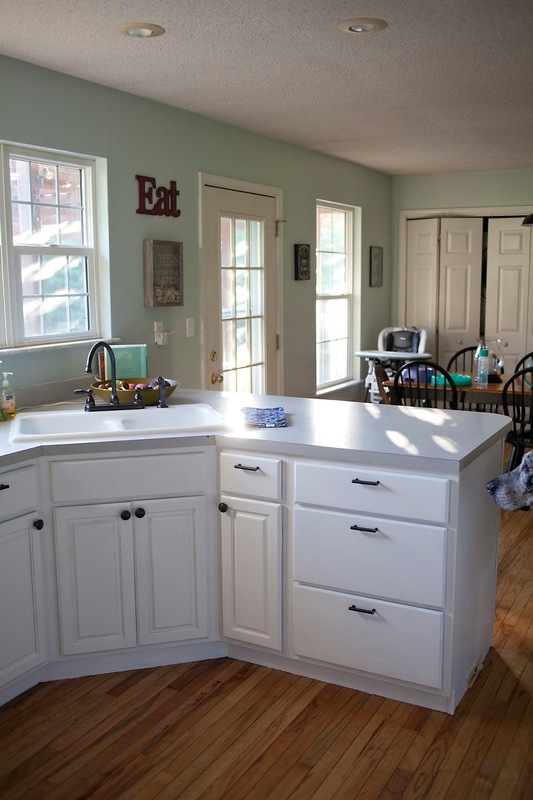 It took about three coats of paint for the cabinets that we did not remove. With the sprayer he only did two coats, see what I mean? Much better coverage! We started painting on Tuesday and were completely finished by Wednesday. We probably should have left them to dry a bit longer but I was so tired of not having a useable kitchen, we sped it along. New sink, new hardware and light fixture and we were finally complete! total cost $500 with $50 coming back to me in the form of a rebate! YAY ME!!! To do; I still need to paint my hideous oak light fixture that hangs in the kitchen. I figure this is the cheapest option. I love love my new kitchen. Would I paint cabinets again, not any time soon. It wasn't horrible, just time consuming and I'm sore from painting. HA! But for us, to get a "new" kitchen it was the cheapest option. This looks so great! For under 500USD, this is just so great. I love how you put this one. 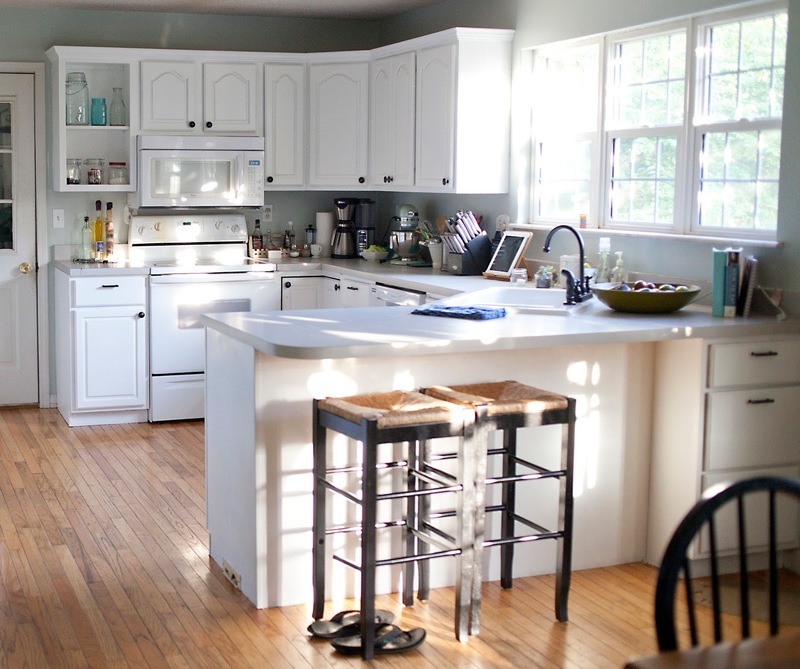 This kitchen renovation is worth it. Thanks for posting this one. 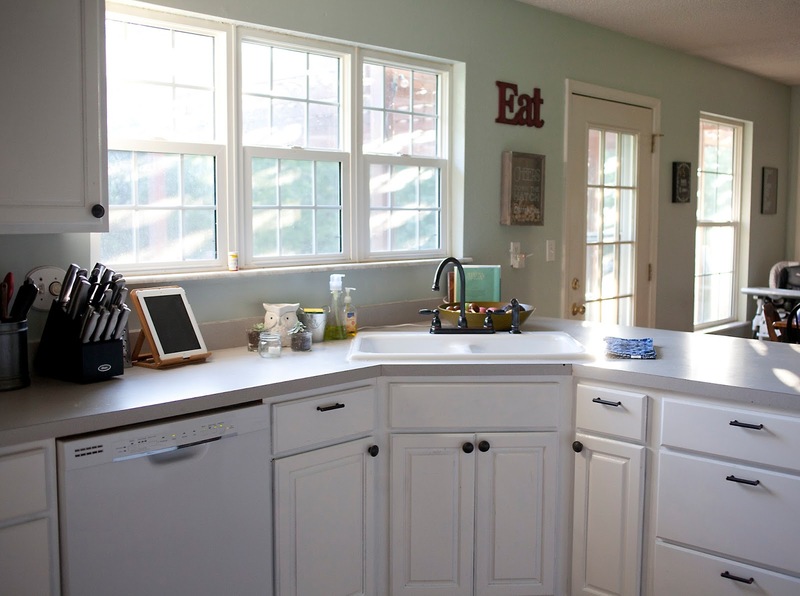 In addition, you can remove the doors of your current cabinets and attach new ones for far less than the price of installing a complete cabinet system. If, you are ready to redesign your home, then you must consult us to know house extension costs London as per your needs, and we will help restructuring the entire home in a budget-friendly manner. I deleted my automobile decomp because they're problematic as you mentioned. Also be certain you upgrade your intake boot to the layout with the alloy clamp. The plastic consumption clamps have a reputation for loosening and causing an air flow which will burn the Saw down. Last, there's an noodle update kit for your carburetor in the event you've got the Walbro. In the event you've got the Zama carbohydrate I believe you are fine. Looking for RTA kitchen cabinets? Simply visit the top store, Cabinet App - Kitchen products online. Here you can explore a wide range of high quality and stylish RTA Kitchen Cabinets, drawer boxes, vanities, organizers, doors, and other products and finishes. All the products can give a refreshing look to your kitchen. I was very pleased to find this site about concrete contractor this information .I wanted to thank you for this great read!! I definitely enjoying every little bit of it and I have you bookmarked to check out new stuff you post.